For some crazy reason, I followed California Mike to the Arctic Circle... last week, in mid-February. It was bbrrrrrisk. First we flew with Aeroflot to the largest Arctic city, Murmansk. This was an adventure in itself. You see, when Aeroflot has mechanical problems with a plane, while in the air, they do not feel its necessary to communicate such matters to the passengers. Instead, they crawl around on the aisle floor doing 'something' with the mechanics below (one doesn't usually get to see that stuff) and then attempt several landings until they get it right. My friend, Emma, was openly freaked out. I reassured her with smiles and jokes while secretly sending a text to my friend in Moscow. It included my family's contact information and my final words. Luckily, he waited until good news came before acting and we eventually landed safely. Some passengers who seemed oblivious to it all were these young hockey players, who were heading to a tournament. Many of them were sporting NHL logos on their toques (hats). I was so excited to see the logos and said 'Hey, I'm from Canada'. They responded with the only English phrases they knew...'Calgary Flames', 'Montreal Canadians', 'Anaheim Ducks', and 'What's your name?' So cute! California Mike's main objective of this trip was to see the Northern Lights. He was pretty set on it. Not that I didn't want to see the beautiful lights; but, being from Canada, I had first-hand knowledge that we can't predict when/where we'll be able to catch a glimpse of the mysterious 'aurora borealis'. However, I decided to come along when he promised reindeer sightings. Of course I didn't expect the first sighting to be on top of a pizza at Mama Mia's. Other menu items included 'Boiled Reindeer Tongue' and 'Ruza' (minced pork & reindeer w/ fried onion and boiled egg). The next day, we headed to Lovozero with Yuri. The hotel clerk told us it would be a three-hour drive, but Yuri managed it in just over two. I sat in the back seat with my hands over my face. It was so cold that the windows were frosted up anyway. He reminded me a lot of my Uncle Don who used to get a real kick out scaring the hell out of me. He had the same hearty laugh and a great sense of humour. Since he got us there safely, we arranged for him to pick us up for our return trip (presuming we'd survive until then). 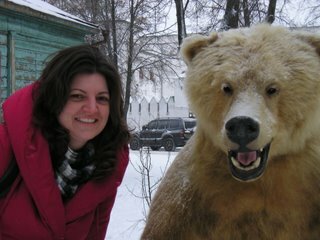 I think he's cute, too... and much friendlier than the typical Moscovite. 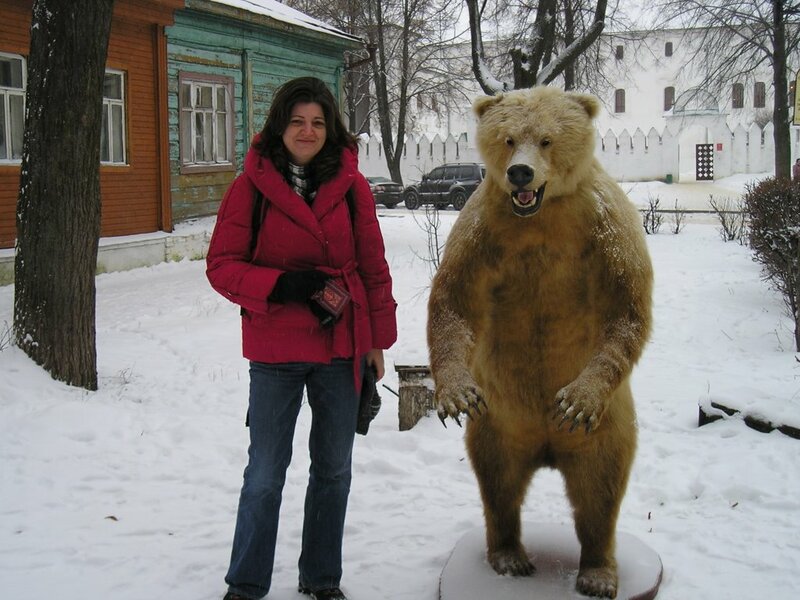 A couple hundred miles south-east of Murmansk, on the Kola Peninsula, we found Lovozero. There isn't much to see here except a few dreary-looking apartment buildings. Many inhabitants are the indigenous Sami people who are either unemployed or work for the reindeer farm cooperative - an interesting BBC article describes their situation best - http://news.bbc.co.uk/2/hi/business/6171701.stm. We were the only guests staying at the only hotel, although we we saw a business-looking man on our last morning. When we asked why people go there, we got a cryptic (translated by Emma) response... 'each has their own reason'. Since we were the only strangers in town, we thought that people on the street might be more interested in us, but they seemed indifferent. There is a very good museum in Lovozero which showed us the different cultures since the 16th century who inhabited the area. The guest book was 15 years old and only a few pages were filled - seemed to be mostly Norwegian visitors. It actually seemed that they had opened the museum just for us, but that too is clouded in mystery. We met Sasha at the hotel. He is staying and working there in an effort to start an outdoor camp for tourists. The salmon fishing is supposed to be great. (I wish we had been served that, as opposed to reindeer at the hotel). Politics and bureaucracy are blocking Sasha's many attempts but he is very patient. Sasha is also working toward a competition in Alaska for dog-sledding next year. He was dressed for a 200 km snowmobile ride to another remote area. Before he left, he hooked us up with a local reindeer herder for a ride to see rudolph 'et al'. We aren't sure if the Sami guy dressed for us or if it was the norm, but we had seen replicas of his traditional atire in the museum. I was on the back of the snowmobile on the way out to the lake and had to keep moving the knives and reindeer teeth hanging off his belt to avoid being stabbed. Not that I would have felt anything. I have seriously never been so cold in my entire life. He actually stopped for a cigarette at one point on the frozen lake while we sat there and froze our extremities. He did stop at his hut for us to warm up as he mentioned that we weren't dressed properly. I didn't take my digital camera because it was so cold I didn't want to damage it. But seeing the reindeer, many of them tethered, was kind of a 'downer' to me. I know that this industry is currently the base for this community, but they just seemed to sad. And, obviously, they many years of visualizing Santa with Dasher, Dancer.... must have had an impact. Can you believe these two weren't dressed properly? They had so much gear, they could barely move their arms. They had a great time playing in the snow on mini-outings... including middle-of-the night peaks for the northern lights. Emma and I stayed in the hotel and played scrabble. Back in Murmansk, where it was a much warmer -17, we did some more exploring. The fog kept us from seeing the inlet to the Barents Sea, only a few kilomtres from us. I really wanted to see an icebreaker that was supposed to be docked there, but, like the northern lights, another miss. We did manage to spot a naked guy running from this sauna to the cold water. Those crazy Norwegians! W We took in a cultural museum prior to leaving and had dinner at 'Alan's', named after my Dad. We managed to survive almost unscathed... Emma had frostbite on her nose. It was so cool to come across this block of snowmen last week. My friend and I were walking to the metro, on a street we know well in the centre, when we turned the corner and were greeted by these charming snowmen. We were so surprised to see them here, in this oh, so serious city. Not so charming was being peed on. Seriously, a few weeks ago I was just walking along near my flat, chuckling to myself about a crude Santa poster that one would never see in Canada (he was packing 'heat'), when I felt a sprinkle on my legs. On the crowded street I followed the stream to see where it was coming from. My point of interest landed on this old drunk guy sitting on the dirty side-walk, leaned up against a liquor store, and letting it all hang out while splattering dozens of others. Wish I could erase that memory. Although I've been here three months now, I am still disgusted and awe-struck almost daily. I'm not yet too sick of the daily train rides because there are so many unusual things to see... like this metro dog, appreciating a warm nap. One Russian restaurant, with a pretty good salad bar, is a taxidermist's dream. There are various mounted animals and skins everywhere - even a fur-lined bar. You can't help but bump into them. It certainly makes you think about what you're eating. Coca-doodle doo! I still have some trouble getting past the fur thing. It hasn't even been that cold here but people where their furs... even when its raining. They look like wet dogs. Yuk! Also fashionable now (the past couple of years here) are mukluks - if you grew up in the 80's you are sure to remember them. I recall liking my fake-fur boots as they were soft and, oh, so comfortable. Here they are the real thing completely fur-covered inside and out.... like little puppies running around their legs... or 'lisas'. Some of the famous Moscow museums, along with the Bolshoi (ballet) Theatre, are closed for renovations this year. Unfortunately, so is the Russian Space Museum which is supposed to be great. This rocket sits on top of it. I discovered it by chance one day when I was out for a walk on a rare, cloudless morning. Across the street was a very large Charles de Gaulle statue. I had to 'google' him to try and figure out what the big deal about him would be to place him in front of the 'Cosmo' Hotel. I haven't gotten to the bottom of it yet, but some of my students have different theories in which phrases include 'corrupt politicians' and 'France didn't want it'. So strange. Like Moscow. I like seeing little ladies 'texting' on their mobile phones. Seems out-of-place to me. I'm off to visit Murmansk, north of 60, for five days. If I don't freeze to death, I'll write more next week. Happy Valentine's Day! 'The Golden Ring' is an old Russian route that forms a circle north-east of Moscow and includes many ancient Russian cities full of history and unique architecture dating from 12th - 17th centuries. One such town is Suzdal, with history dating back to 1024. I went along with some teacher friends for the 4-hour bus trip (that's an extra 45 minutes with a flat tire). We the spent a night in a little wooden house inside a monastery. Being British, they were most fascinated by the snow - I was not so much. But it obviously added to the charm. With over 30 churches, Suzdal is most picturesque and seems like a small town with rivers running through it. Emma and I had to help Carol, who was sliding down the hill... a testament to the quality of Russian boots. By the way, 'Carol' means 'King" in Russian and the Russians think its hilarious for it to be a female name. After that we sampled the regional drink, Medsomethingorother... a wine made from honey. I haven't learned how to pronounce it yet but it sure is yummy. I love the colours in the photo of Gaynor. These are her pictures since I forgot my camera (can you imagine?) but she let me take a few shots. Little houses with the fancy windows frames are on every street. Apparently the same type of window frames are popular in Siberia. Check out my new guy! I met him in a 'Golden Ring' town outside of Moscow. I've always preferred the strong, silent type, but maybe you can see... I'm trying not to get too close. He's Russian and I'm not. Actually, I had bargained with the little old man selling the photo opportunity and was quite pleased with myself for the 12 ruble deal when walking away. Then my friend, who understands Russian, told me he was saying 'please help me'. The guilt cost me an extra 20; but, the sweet little man with shiny blue eyes and red cheeks held onto my hand and thanked me profusely (at least I think that's what he was doing... the translator didn't catch it).